A web may need to be decurled for two reasons: one, to remove curl that has been wound into the roll (sometimes called "roll set"); or two, to remove curl that has been caused or magnified by the process. Martin makes two kinds of decurlers: pre-press (or pre-process) and post-press. 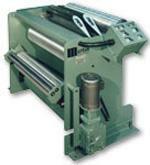 A pre-press decurler is located before the printing units and is intended to help remove roll set. Pre-press decurlers typically follow the diameter of the unwinding roll, automatically providing proportionally greater decurling as the roll diameter decreases. They may use drag-bar or rolling elements, depending on the substrate. Martin supplies pre-press decurlers as either free-standing units or integrated into other equipment. Martin's post-press model is located after the process and is designed to provide an essentially flat web to a sheeter or diecutter. With its "constant path length" feature, a post-press decurler will not affect the print-to-cut register. This allows it to be located directly before the diecutter, so that the operator may make immediate corrections based on the curl observed. If you don't see quite what you're looking for, please contact us to discuss your specific needs. We invite you to put our resources to work for you.